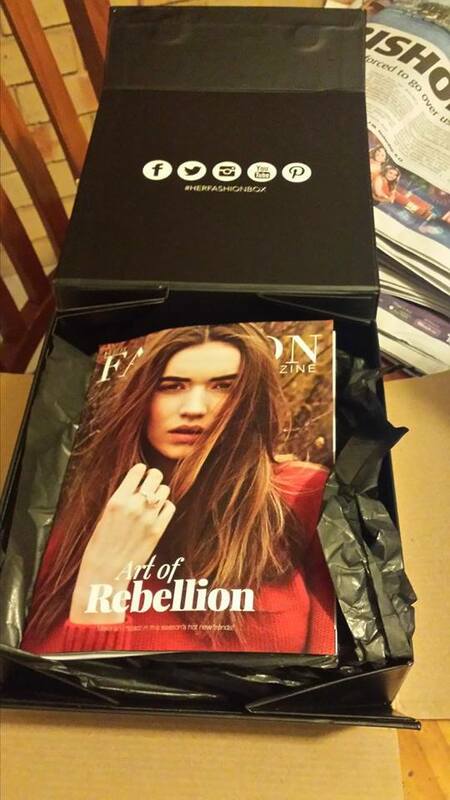 When I should have been doing something else, I read this article about Subscription ‘Fashion Boxes’ (see left). And it piqued my curiosity! Boxes containing fashion and beauty products sent to the buyer each month (for a flat rate), according to the buyers’ specifications and in line with the fashion ‘season’. 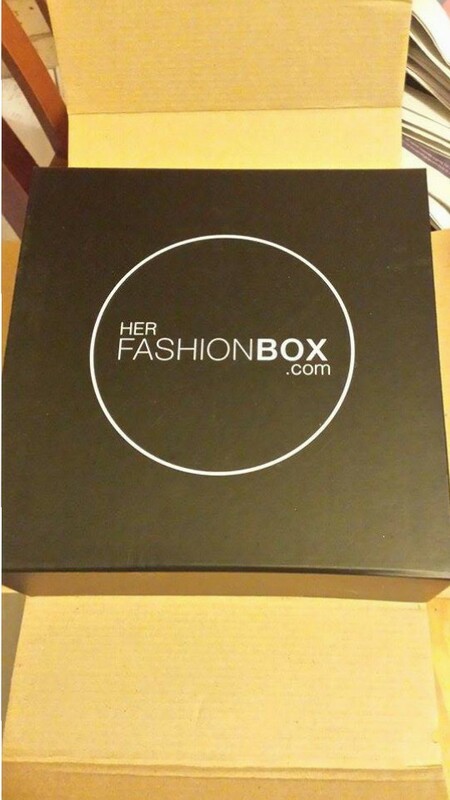 HerFashionBox.com was started by Kath Purkis in May 2013; she and her team now ship globally and are one of the industry leaders in subscription commerce for fashion. She founded her first online fashion boutique at 21. Which is wicked. I love an inspiring femme! Something I loved straight away was how in-depth the style profile is. I ordered out of curiosity, because I hover between being either super fussy or super spend-y (is spend-y a word? It is now!). I was very curious as to what would be sent to me with my quirky taste in accessories, straightforward approach to make up and changing lifestyle (currently transitioning into an early 20s career lady – body, mind and wardrobe). 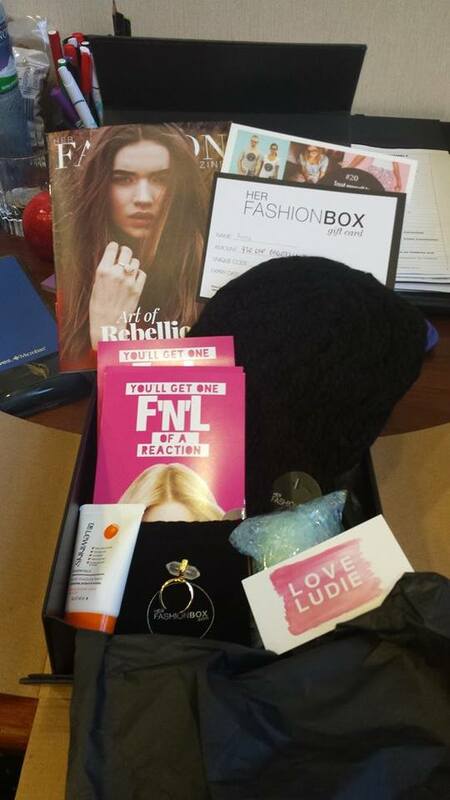 Would this box saite the professional, the fashionista AND the blogger? I bought the ‘Classic’ Box for the standard fee of $39.95. The Box itself is slim and modern. Aesthetics, Tick! Presentation of items: Excellent, carefully wrapped and layered in matching tissue paper. The glass candle was bubble wrapped. The contents are seasonal – moisturiser and a beanie are very suitable purchases for winter. It doesn’t seem like much when you open the box – However, upon examining the contents, I got $40 worth of vouchers alone, which is the cost of the box. Moreover, the beanie would be worth roughly AUD$20, so that’s $60 of value without counting the other items. I don’t wear beanies – But, I put down that I wanted a hat in my Style Profile, and it is winter. But at the same time, I don’t own a beanie – so it is more a ‘challenge’ piece. I got something I don’t own and I had an initial mixed reaction – but it is still cold so I can still wear it! I decided to change my Box from the ‘Classic’ to the ‘Trendy’ after today. 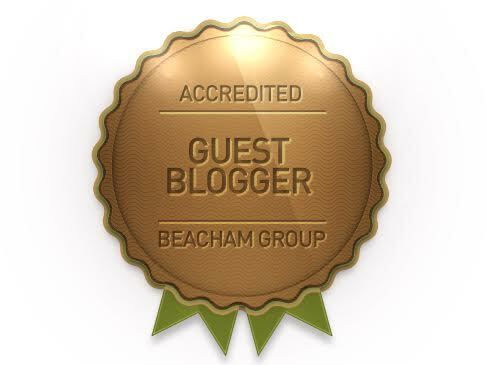 I suppose ‘Trendy’ might better describe me – who knows? Maybe I’ll try all 3. The News.com.au article was a bit deceptive in its title. HFB doesn’t include clothes in their Boxes, but they do have an online shop which is pretty nifty and on trend. I wanted some pieces to add interest to my style palette, maybe some things I wouldn’t necessarily buy for myself – I was challenged by what was in my ‘Classic’ Box, and I gained a bit of an understanding of myself and my own style as a result. I got what I paid for! Will I get another Fashion Box? Yes. Would I recommend them? Yes. Whether you’re me, or just want to add a couple of interesting pieces to your style palette, or just for someone else to do the hard work for you for a couple of months – go for it. An honest tip from one user to another would be to take your time doing your Style Profile. I updated mine after today at no extra cost. Which just gives me another reason to love this service – you can update your subscription any time at $0 extra cost. Will share my thoughts on the ‘Trendy’ Box next month.